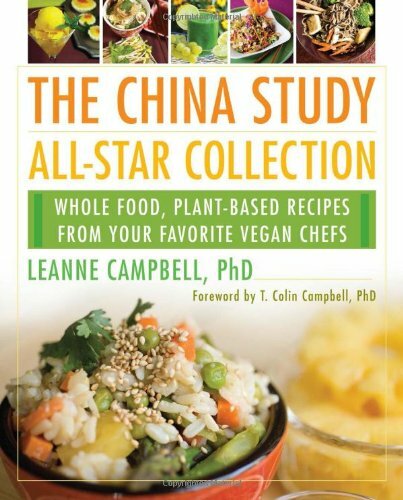 The China Study All Star Collection, Leanne Campbell, PhD (BenBella Books, 2015) - Vegans Eat What? Vegans Eat What? Help support VegansEatWhat,com by buying this book via our Amazon link! Leanne Campbell is a daughter of T. Colin Campbell, the author of The China Study. That book documents the considerable health benefits of following a plant based diet. Leanne’s new cookbook shows us how to eat this way by selecting and presenting interesting recipes gleaned from a number of exciting sources. Her book includes delicious recipes to assist both the veteran and the novice plant-based cook to create dishes guaranteed to satisfy every palate. Leanne’s book is a collection of recipes from eleven previously published chefs, cooks, doctors and bloggers. She has included numerous well produced photographs of the dishes she presents which will entice the reader. The recipes in the book are accompanied by comments from the chefs who created them. Each individual chef provides “how to” information on the preparation of their recipes. In addition, the book provides capsule biographies of all the contributors whose recipes are presented. These biographies introduce us to each chef and provide some information about their experiences with food and recipe creation. We tried several of the recipes published in this book. Each was different and all were delicious and easy to make. We have shared these with friends, especially those who have said they prefer recipes that do not take a long time to make. One recipe that we tried on our friend Kris with great success was the Fresh Corn and Zucchini Frittata by Christy Morgan ( Blissful Bites). We were able to prepare the dish very quickly and it was so tasty that we all had seconds. Kris now makes this dish regularly for friends and family. Another recipe that we use regularly is Laura Theodore’s ( The Jazzy Vegetarian) Maple-Scallion Dipping Sauce. When we make baked tofu bites, this is our “go-to” dipping sauce. It’s simple and fast to prepare and so very tasty. We also enjoyed the Black-Eyed Pea BBQ Stew by Christy Morgan (Blissful Bites). The flavors were great and the mix of the black-eyed peas, carrots, peas and diced rutabaga, while not a common combination, is very well worth the effort. Another interesting taste and visual delight was the Shredded Brussels Sprouts & Kale with Miso-Dijon Sauce submitted by Heather Crosby ( YumUniverse). For those intimidated by Brussels sprouts, shredding them, as this dish calls for, lessens the sometimes strong flavor that some find distasteful. The sauce itself is a winner, though I doubled it as we prefer our dishes to be well sauced. I would recommend this book to anyone interested in a variety of flavorful, healthy plant-based recipes. This is a great source book for experienced vegans and those who are interested in trying vegan cuisine. Combine all remaining ingredients in a food processor. Blend until smooth and no tofu chunks are visible. Be sure to scrape sides of processor several times to incorporate all ingredients. Place tofu mixture in bowl with veggies. Blend to combine ingredients well. Fill a lightly oiled 9 inch pie pan with the mixture and press into pan smoothing over the top. Bake for 50 minutes uncovered. Note: feel free to change the vegetables for a slightly different flavor.